Police at the scene in Wynyard Road. A driver who led police on an hour-long chase has been jailed for 16 months. Wayne Wright was arrested after the Hyundai he was driving collided with a police car in Wynyard Road in Hartlepool. The chase began at about 9am and ended at around a 10am. Police tracked the black Hyundai using patrol cars and the air support helicopter during the incident. Wright, 24, of Inverness Road, Hartlepool, denied dangerous driving on October 27 last year. He pleaded guilty to the offence on the day his trial was due to start at Teesside Crown Court. “It’s not the sort of thing you expect to see on a Friday morning in Hartlepool,” said a resident at the time of the offence. “It was lucky that no one was hurt as there were lots of children around because it was the school holidays. Another resident said: “There were so many people on the street shortly after it happened. “A lot of them were teenagers, probably because it was school holiday time. “Thankfully none of them were hurt, which they could have been because the street was very busy. “There were lots of police vehicles around, and it was shocking to see this happening so close to home. Wright must take an extended test if he wishes to drive after the ban expires. 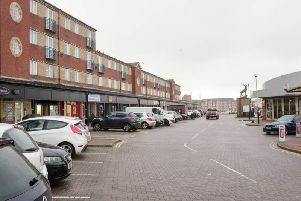 A spokesman for Cleveland Police said at the time of the offence that they were notified of the vehicle travelling around the Hartlepool area from about 9.05am. The spokesman added: “It was followed and monitored using police vehicles and NPAS (air support, ie helicopter) and the incident concluded when the car was brought to a stop then collided with a police vehicle on Wynyard Road at around 10am. Brian Loan, 30, of Wynyard Mews, Hartlepool, denied allowing himself to be carried in a vehicle he knew was stolen. Prosecutors accepted his plea, and a not guilty verdict was entered on his behalf. Judge Simon Bourne-Arton sentenced Wright to 16 months in prison, and banned him from driving for 10 years.